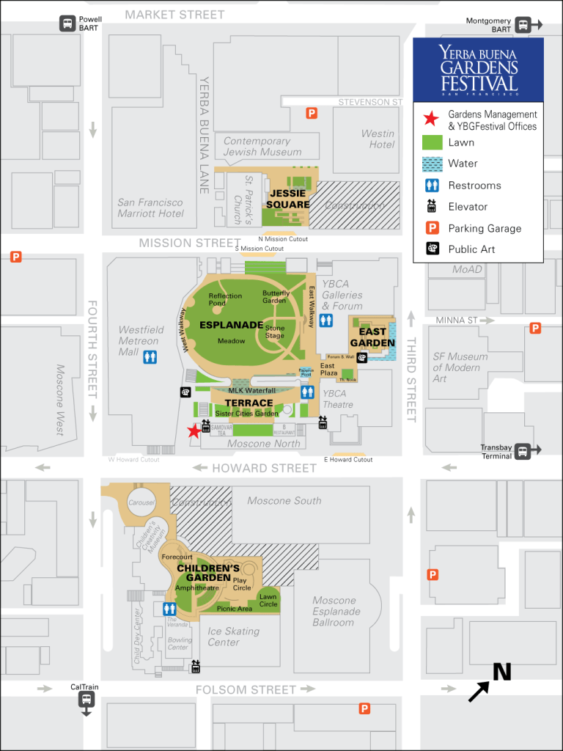 Let’s Go Salsa@Jessie!, the open-air salsa dance party in Jessie Square (near the Contemporary Jewish Museum), takes place on the third Thursday of each month from May to September from 6-7:30 pm. Performers include the Carlitos Medrano & Sabor De Mi Cuba on May 16, the Jesús Díaz y Su QBA on June 20, the Cabanijazz Project on August 15, and Ricardo Lemvo on September 14. Children’s Garden Series features Interactive half-hour shows for kids under 10 & their adults. School groups and camps welcome. Featuring Children’s Creativity Museum’s 20th Anniversary. A flamenco troupe, a galloping stallion and a rumba circle Ka-Hon on June 7 (This children’s program repeats at 12:15pm Friday, 6/7/19), Pi Clowns on June 14 (This children’s program repeats at 12:15pm Friday, 6/14/19), Circus Bella – Up in the Air on June 21 (This program repeats at Noon Saturday, 6/22/19 and again at 2:15pm Saturday, 6/22/19) and more. Thursday Lunchtime Concert Series takes place most Thursdays from 12:30 to 1:30 pm. Bring a lunch and a blanket and kick back on the green grass with friends and work-mates. Music by local and international artists is guaranteed to make the afternoon fly including oghosthaze on May 9, Community Music Center Older Adult Choirs on May 16, Afro-Cuban Ensemble of SFSU on May 23, Sandy Cressman’s Homenagem Brasileira on May 30, The Onyx on June 6, Latin Jazz Youth Ensemble of San Francisco on June 13, Marcus Shelby Quartet on June 20, Edgar Pantoja & the Afro-Cuban Tribe on June 27, Sueños on July 11, Murasaki Ensemble on July 25, LINES Dance Center on August 8, Kim So Ra: A Sign of Rain on August 15, Rob Reich Swings Left on August 22 and The Anita Lofton Project on September 19. Yerba Buena Gardens Festival presents Poetic Tuesdays on the second Tuesday of each month from May 14 to October 15. Guest curated by Litquake, Poetic Tuesdays runs from 12:30-1:30 pm and features an array of poets and music. 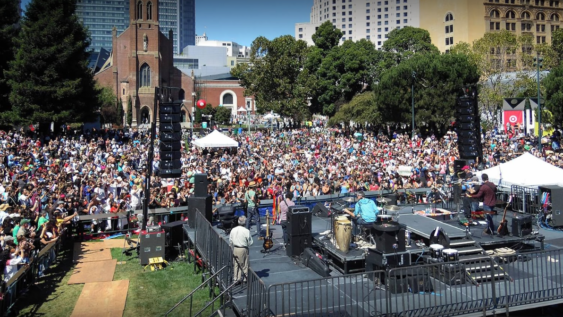 Opening Day: The Yerba Buena Gardens Festival opens on Saturday, May 4 at 1 pm featuring a Tribute to Charlie Palmieri by the Uprising All-Stars. The production combines New York’s finest purveyors of Latin dance music with world-class Bay Area talent, including trombonist Doug Beavers, conguero Little Johnny Rivero, and Santana bongo master Karl Perazzo. New York heavyweight Arturo Ortiz, who’s collaborated widely with Latin music giants like Rubén Blades, and Marc Anthony, is the ideal cat for the piano chair. Each and every week and weekend, the Festival presents a curated lineup of musicians, dancers, poets, and artists from around the world including the street dance theater company, Embodiment Project on May 11, the Roma brass band sensation Džambo Aguševi Orchestra on May 18, Circus Bella – Up in the Air on June 21 (This program repeats at Noon Saturday, 6/22/19 and again at 2:15pm Saturday, 6/22/19), a classically-trained tenor who won Canada’s prestigious Polaris Music Prize Jeremy Dutcher on June 29, Philippine-born singer/songwriter Aireene Espiritu will be making a Tribute to Sugar Pie DeSanto on July 6, Yerba Buena Gardens ChoreoFest on July 13, Brooklyn Raga Massive featuring Martha Redbone Roots Project on July 20, Berkeley-reared, Juilliard-trained pianist, composer, activist and writer Samora Abayomi Pinderhughes on August 17, and the SFJAZZ-commissioned Brass, Bows & Beats: A Hip-Hop Symphony on September 14. Yerba Buena Children’s Garden is located at Howard & Fourth Streets. Two performances each day: 11-11:30 am and 12:15-12:45 pm, except Circus Bella and Halloween Hoopla.